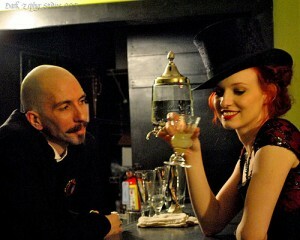 The Green Fairy finds a New Home in Walker’s Point (21 May, 2010, ‘Third Coast Digest’)) | Industrial Strength Publicity, Ltd.
Club Anything’s new absinthe lounge opens for business tonight. 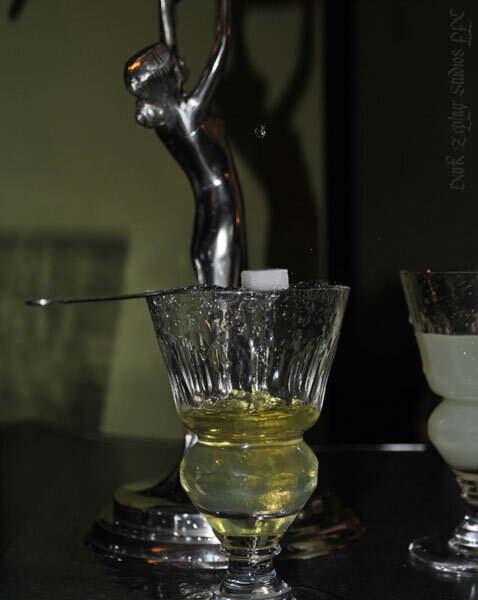 Elixir will be located in the club’s back room, complete with the appropriate apparatus (absinthe fountain, slotted spoons, glasses) and a server well versed in the history, preparation and correct serving methods for absinthe — both as a ‘drip’ and as a cocktail additive. Founder and Chief Distiller from Milwaukee’s Great Lakes Distillery (the supplier of Elixir’s featured absinthe varieties, Amerique 1912 verte and Amerique 1912 rouge) Guy Rehorst will be on hand tonight offering free samples and answering questions about this historically enigmatic beverage. that it caused “inappropriate behavior,” a claim that has since been disproven. 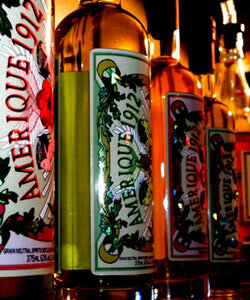 Thujone, once thought to be absinthe’s active ingredient, received the blame for the erratic behavior that was (reportedly) caused by drinking it. Now regulated in the U.S., drinks containing it must have less than 10 parts per million, which allows them to be designated as thujone-free. According to Rehorst, however, it was recently determined that thujone doesn’t survive the distillation process. Rumored to inspire creativity and act as an aphrodisiac, it has gathered a worldwide cult following. The anise-flavored spirit has a high alcohol content (up to 72 percent ABV) and is made by steeping wormwood (an herb related to the daisy family), anise and fennel. 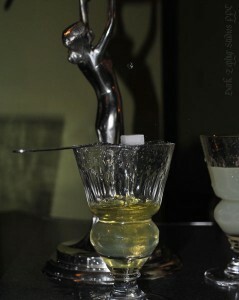 A traditional “drip” is made by dripping cold water from a stylized fountain (a strange and beautiful contraption with four spigots that operate at varying speeds) onto sugar, which rests on a slotted spoon into a glass of absinthe, sweetening the somewhat bitter taste. It then turns into a white liquid called “louche” as the essential oils separate. Gland” (which combines gin, orange juice and grenadine), “Death in the Afternoon,” a champagne cocktail reportedly invented and named by Hemingway after one of his books, and plenty of other creatively-named and concocted beverages. A variety of beers and wines are also available. Starting in a few weeks, the lounge will be open regularly Wednesday through Saturday from 5 p.m. to bar close. For further information, please see Elixir’s website .